Check out Draft’s LV artist page for his social links, music and other related articles! Draft (real name Liam Tallon) is a producer of “acoustic electronica”, based around London in the UK. The ‘Draft experience’ grew out of him creating what he perceives as ‘downtempo’ music. He wanted to produce fresh but relatable, where listeners could understand that real-world instruments were used on top of the usual synths. The “acoustic electronica” label gives him room to move creatively, though it’s always a gamble whether people will be into his whole catalogue! Draft learnt the guitar as a child, picking it up from his father but he began to actively engage in music around the time of The Prodigy’s Fat of the Land, as well as the golden era of Jungle and UK Garage. Other influences were a cousin who DJ’d on pirate radio in London and the nights when he would go out to clubs and experience the music first hand. A Hohner Arbor series. His first guitar, a cheap Fender Strat copy that was awful but good to learn on. A red Encore, also acquired when he was younger. A BC Rich Warlock, purchased after a lot of hard work. Slayer’s Kerry King was a big influence, and this was an important purchase for him, though the guitar is now in need of serious repair! An Epiphone Les Paul Special Vintage edition. An Ibanez Iron Label FR Series. As well as the guitar Draft plays the piano quite well, is currently “figuring out” the bass, is “pretty fierce” on the Irish tin whistle, and once played the recorder at London’s Royal Albert Hall when he was in school. Finally, thanks to his background in metal he plays the drums to a good standard too. In general, he likes learning instruments and sees it as a sign of his desire to constantly level up and to keep pace with what’s happening around him. Draft got his first release on Luke Hood’s Pilot Records through his manager at the time. While he was thankful for the chance to work with Pilot, who weren’t relaxed on style, Draft did have some issues with them, including a lack of energy on the promotional side. So, despite his manager telling him he wasn’t quite good enough for mau5trap, he decided to send “If” to Chris Johnson, and they went for it. An avowed metal fan, Draft was initially into Doom metal bands like Candlemass, before branching out into Iced Earth (check their epic Dante’s Inferno), Slayer, Metallica, Slipknot and more. He was always after the heaviest music he could find, where the vocals were still intelligible. For Draft, there are some parallels between the electronic and metal communities, particularly their passion and fierce support for their chosen artists but the key difference is metal’s respect for its rich history, whereas EDM fans are quicker to downplay artists outside of current trends. As well as his core alias, Draft has created LJT as a new venture where he can write more freely for other artists, without needing to worry about promotion and without damaging his brand. When producing for others as LJT Draft approaches work as if he is sitting in a commercial session, where he only has access to standard tools. As such, he has acquired products like Slate’s ‘Digital Everything’ bundle, some of the Waves range (like their SSL emulations) and UAD’s Fairchild, which is gorgeous for vocals. Draft has been working with SID (Aka DJ Starscream, or 0 from Slipknot) after reaching out to him, having heard a couple of tracks SID released on SoundCloud (check out his new album Sexcapades of the Hopeless Robotic). SID asked Draft to do a remix for the track Without You, which Draft has approached in a hard-hitting Prodigy style and is in the process of being mastered. Draft rarely gets creative block now, though he struggled a lot with it in the past and questioned a lot of what he was producing. Now, if something isn’t working, he shuts everything down and walks away — he suggests going outside and ‘looking up’, or just getting your head out of that environment. Having other interests helps and Draft enjoys running, Brazilian Jujitsu, reading books and socialising. He used to brag about his 18 hour studio days but now, when he sees producers doing this, he questions how much of that time was creative, or supported learning. Getting If onto mau5trap’s We Are Friends was a major personal milestone for Draft and he felt he had achieved something by featuring alongside top producers like Feed Me, Skrillex and deadmau5, even though he didn’t think people ‘got’ the track. That said, experiences like supporting Goldie’s Metalheadz with a set at Boiler Room, or developing a relationship with Two Fingers meant a lot more to him because at that stage in his career he really needed them. Draft also had a friendship with the late Robert Dickeson (AKA Robert Oaks, Apex and Midnight Lamp), who was a huge factor in his career in every way. After striking up a friendship on a long weekend tour in Austria, when they both worked with Lifted Music, they were in regular contact up to 2010, until they eventually reconnected three-four years ago. Draft says Robert was an incredible talent and he still has a large collection of unreleased demos and tracks from him. One is an incredible, complex piece called Celestial Traveller that is about 23 minutes long and features a re-work of the Apex remix of Just One Second by London Elektricity (NB: Draft recommends you listen to this immediately if you haven’t already). From his experience of dealing with what happened to Robert, Draft would like people to understand how much difference it can make to someone when you give the time of day if they reach out. Draft mentions Apex’s remix of London Elektricity’s Just One Second as an example of Robert Dickeson’s incredible production talents. An FL Studio user since the (dark) Fruity Loops days, Draft became so adept with the DAW that Image-Line saw fit to award him ‘Power User’ status, in particular because of his Inside the Project videos. Draft can’t recommend FL Studio enough, and FL Studio 20 offers exactly everything that he needs right now. In terms of plugins, Draft uses FabFilter, Valhalla (again) and Melda Production products, in addition to FL Studio’s stock tools. Draft is a fan of Arturia’s soft synths and also uses Serum and Massive, though when he uses the latter two he does a lot of work to steer clear of their “digital” sound. Other than his Apollo Twin audio interface and Micro Korg, hardware has never really appealed to Draft. He appreciates the human touch hardware can give a recording but thinks he can get more life out of a guitar. Draft’s approach to selecting tracks for his EPs varies. With From Inside, Draft completed eight tracks and selected the tracklist from this final set. They all fit the style and ethos he was pursuing and he presented the EP to mau5trap as “this is how it’s going to be”. On Patience & Time, with a couple of tracks complete he decided the EP should be more varied and so produced a complete re-work of The River, followed by Steamroller to balance it out with heavier feel. For his next release — Draft’s first LP — he has to be in a dark mood to work on it and as a result, it’s the darkest stuff he’s ever written. The production time on his tracks varies from weeks to months, to years. For example, Letheia on Patience & Time started life back in 2014, whereas Bishop Takes King only took a couple of days. While Draft can spend hours tampering with sound design, he recognises this can make you lose sight of your goals for the track. Hermon Hill is Draft’s favourite tune and he has revealed that the track is actually less than people expect. The melody is a single guitar with a MIDI harp instrument layered over the top, pitched up, cut-up and re-arranged — a process that took weeks to complete. This approach was necessary because — despite multiple attempts — he could never play it himself (anyone is welcome to prove him wrong!). Draft has developed an analogy of a mix as a book — when someone is reading a book to you, the spine is staring you straight in the face and the pages fan out on either side. This is how he tries to implement his mixes. Draft doesn’t enjoy overly clean mixes. He finds they sound unnatural and likes to retain some mud or “earthiness” in his mixes, which also draws on his love for Prodigy, metal and their particular sonic characteristics. After a long time, Draft has finally gotten into the habit of consolidating tracks. Previously he would keep a synth un-rendered as long as possible, “just in case”. Eventually, he was convinced by Two Fingers to not fear the commitment of rendering tracks out … and the bonus is you have much fewer tracks to mix! 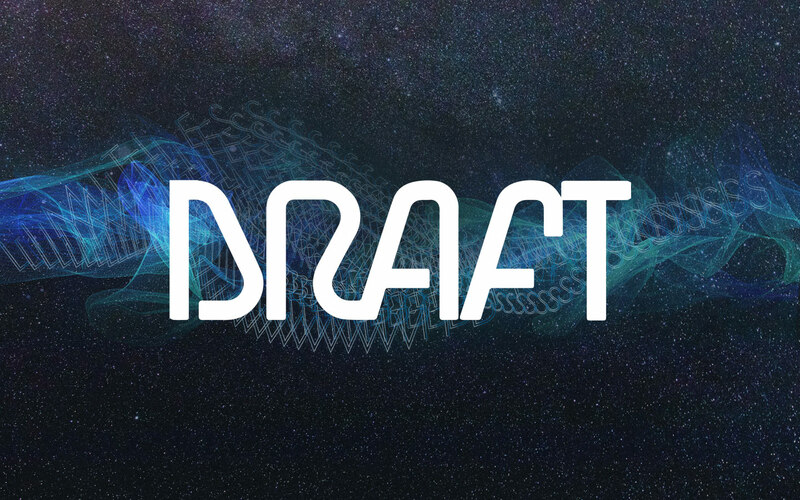 When it comes to mastering, Draft is entirely self-taught but tries to evolve continually. His last mastering chain (for From Inside) consisted of a compressor, a couple of EQs, a multi-band compressor, a couple of limiters, an exciter and an imager. He likes to use multiple limiters to achieve a more gentle result than brick-walling. From _@FnfnMsd “The difficulty to resist the corruption in the music industry — how to stay true and humble”. For Draft, it’s about passion. Most people get into music because they have a passion for making other people feel something and the best way to avoid ‘selling out’ is to focus on that. That said, if you need to eat, it’s OK to ‘sell out’ to survive. From @badeyemusic “What types of genre warrant creating separate aliases outside of Draft and why you feel (or not feel) the distinction is necessary”. The name ‘Draft’ comes from the amount of unfinished projects he had on his computer in his early career. First, Draft got to the stage where he could finish tunes. Next he reached the stage where he could release tracks and people would pay. Then, he was at the stage where labels would offer him EP deals and advances and could pay for everything out of the Draft alias. Therefore, anything that doesn’t fit under Draft goes out under a separate alias because he doesn’t want to pollute his core brand. Music released under LJT doesn’t mean he doesn’t respect the output — it’s just another avenue because Draft is so possessive of his main alias, given the time invested in it.